Grand Central Publishing, 2016, 288 pages. It is quite possible, as great philosophers have pointed out, for a misguided or totally erroneous action to have positive consequences. So might be the case with Lin-Manuel Miranda’s smash Broadway hit “Hamilton.” For, despite a conception and a style that grievously misrepresents the significance and character of Alexander Hamilton the nation-builder, Miranda’s play has stirred an interest within the American public, including youth, in the life and work of the American Founding Father whose legacy is urgently required to be revived today. I should admit, right off the bat, that I have not seen the Broadway show. Rather, I have read the book-length libretto, which includes supplemental essays by Miranda and a number of other individuals involved in the production, including historian Ron Chernow, who authored the biography of Hamilton which inspired Miranda’s work. In fact, I’m not sure that I could sit through the hip-hop/rap production. Contrary to Miranda’s intention, Alexander Hamilton cannot be truthfully presented as an icon of popular culture (in this case, hip-hop) without degrading him and his accomplishments. But, even if one could put the question of style to the side, what’s clear in the libretto is that Miranda, while he might admire Hamilton for his guts and fighting spirit, does not understand the significance of his work for the survival of the American Republic. Therefore he doesn’t present Hamilton’s vision of an industrial republic based on technological progress, and is reduced to portraying him as an ambitious, brilliant thinker whose rivalry with Aaron Burr (whom Miranda considers equally brilliant) leads to his tragic death through the duel. Miranda is explicit, both in the book discussion and in other interviews, in saying that the play is pivoted on the rivalry between Hamilton’s murderer, Aaron Burr, and Hamilton. Thus Burr is anachronistically presented in the opening scene as part of a quadrumvirate of revolutionaries, but with a character the opposite of Hamilton’s—calling for caution and dissimulation, rather than a forthright championing of the cause. He then appears periodically throughout the rest of the play, both as a collaborator of Hamilton, and a jealous critic. Even as Burr assassinates Hamilton, Miranda continues to present the assassin as a tragic figure rather than the deliberate antagonist in a dastardly plot to destroy the Union. Miranda has to know better. Having read Chernow’s book and much of Hamilton’s own writings, he has to have learned that Burr was up to his eyeballs in sedition, even before his skullduggery in the Western lands. Burr’s run for governor of New York in 1804, for example, was explicitly part of a scheme to split New England off from the United States, a scheme which Hamilton worked his heart out to defeat within the ranks of his fellow Federalists. Hamilton understood Burr to be a “would-be Caesar” or Napoleon in the United States, and was determined that he be defeated. Hamilton’s success in defeating Burr in that 1804 New York election was the direct precursor of Burr’s challenge to a duel, and there is no way that Hamilton could retract what he had done. Yet Miranda’s “Hamilton” totally ignores this political substance. The difference between the two men is presented as a difference in personal style and in “luck”—the fact that Hamilton had the trust of Washington, married well, and often threw caution to the winds in pursuit of his aims, whereas the “prudent” Burr was constantly operating behind the scenes, lost his wife to illness, and was unable to climb the same ladder of success. No wonder Miranda cannot present the real contribution of Alexander Hamilton to the building of our Republic. Hamilton was not a cocky young kid from the Islands trying to “make it;” he was a strategic thinker, genius, and actor who grasped the core economic principles upon which the American Revolution had to base itself in forming a government that would last, and who brilliantly fought to ensure that these principles were built into the founding institutions, especially the Constitution, of the United States. Hamilton showed indications he understood the basic principles as early as 1774, when he first became a polemical pamphleteer in favor of the American embargo against Great Britain. In The Farmer Refuted, he took on the loyalist arguments that the revolutionaries were a bunch of merchants out to destroy the interests of the farmers, and laid out the concept of a harmony of interest between these two economic groups. By the time of his landmark Reports to Congress—the two Reports on Public Credit and the Report on Manufactures—Hamilton had further developed this concept by expounding on how the ever-increasing productive powers of labor, fostered through innovations in technology and in building infrastructure, served as the basis for prosperity for all sectors of the economy. These reports must be read in order to understand both his intention, and the actual workings of the credit system which Hamilton created. 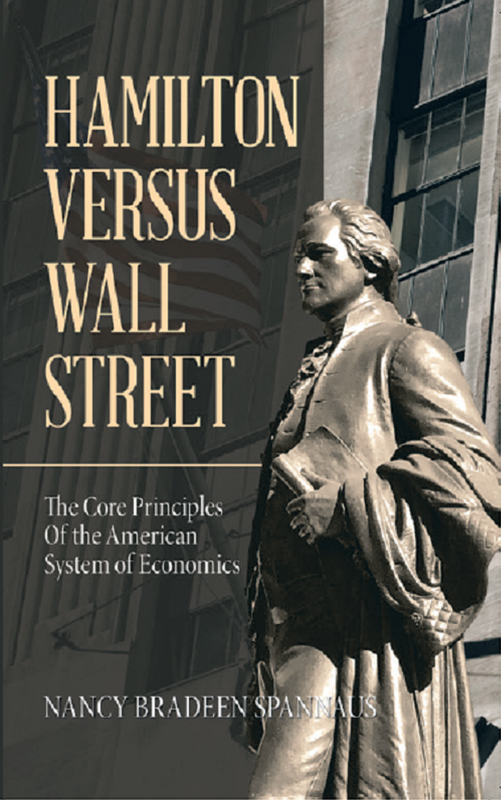 The difference between Hamilton’s conception of economics and that of Burr can be seen, in the small, in the difference between the banking institutions they established. Hamilton was a founder of the Bank of New York, as well as of the Bank of the United States. Both of these banks were explicitly devoted to increasing the wealth of the nation by promoting industry, commerce, and agriculture; Hamilton insisted that banks be “nurseries of national wealth,” and not vehicles for speculation for private gain. Burr, on the other hand, was the prime mover behind the establishment of the Manhattan Company (ultimately Chase Manhattan), an institution which he succeeded in getting chartered by the state of New York on the pretense that it would fund vital water infrastructure for the City. But Burr and his closest collaborators never intended to build the water infrastructure at all. Burr inserted into the charter language that would permit “surplus capital” to be used to set up banking operations, which he rapidly turned into a means of accumulating private riches for the investors. By virtually all accounts, the necessary water system, for which Hamilton had developed extensive plans, was never built. Writ large on the national stage, the difference in approach would spell disaster for the nation, and that is exactly what Burr, and his British sponsors, were out to accomplish. Having established the Bank of the United States and the national Treasury infrastructure, Hamilton was determined to use them to achieve economic progress that would pull the various sectors of the nation together. Burr’s (and Jefferson’s) approach, to the contrary, would pull the nation apart. And while Burr was able to kill Hamilton, he was not able to kill the core ideas behind the economic system—and the Constitution itself—which Hamilton had created. They lived on, and were revived repeatedly by such as John Quincy Adams, Abraham Lincoln, and Franklin Delano Roosevelt, to name the most effective. Alexander Hamilton deserves to be given his due as a leading Founding Father of these United States, and the United States desperately needs the concepts which he outlined, particularly in the Report on Manufactures, to be put into practice today. We have swung ominously far in the direction of Burr’s Wall Street-like practices, and are letting the actual physical economy and general welfare go down the drain. Today, the Hamiltonian approach calls for cleaning up the banking system by cracking down on speculation through re-imposing Glass-Steagall, and bringing back an activist governmental approach to providing credit for infrastructure through national banking and support for science-driver projects such as the space program. If Lin-Manuel Miranda’s work inspires youth to seriously study Hamilton, that’s great. But don’t rely on him for real history, or for conveying the lasting contributions of the genius behind the American System.